"If Bricks Could Talk" is a study undertaken in an attempt to design a simple concept in for a family Christmas Card. 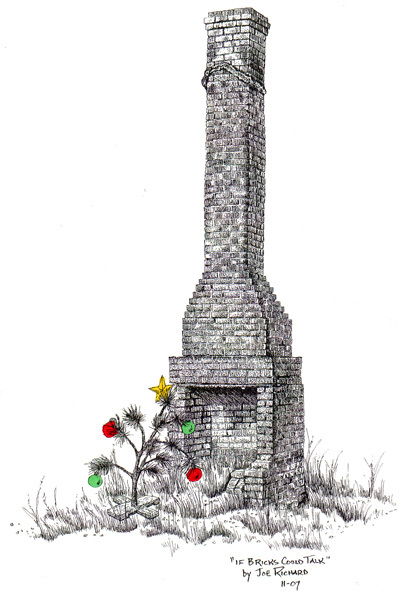 The image depicted is an old chimney that currently exists in southwestern Louisiana set back nearby a remote country road. The small Christmas tree was added to enhance a holiday theme and was enhanced with a touch of spot color. "If Bricks Could Talk" was a study in line art and shadow techniques. This study in pen and ink techniques was completed in November 2007. The work took approximately 10 hours to complete and measures about 8 x 11 inches on an 11 x 14 background.